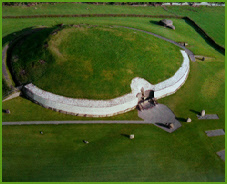 Inside the passage tomb, the winter solstice phenomenon is explained as well as the ancient burial ritual. The purpose for which it was constructed remains uncertain. It may have been a burial place for kings or a centre for ritual – although the alignment with the sun at the time of the winter solstice also suggests it was designed to act as a calendar. of the pagans at its most powerful site. last until catholic Emancipation and the land acts of the 19th century.